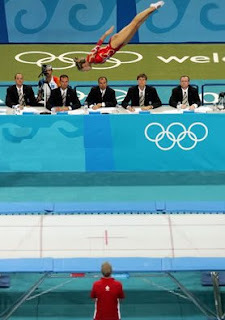 Let me get this straight: Baseball gets voted out of the next Olympics, but Trampoline is safe? Word is Dave Duncan might not re-up with the St. Louis Cardinals next year as their pitching coach. Dave should tell his wife to expect 31 phone calls from GMs around the league. Oh...and that sound your hearing....it's the Brewers and Cubs dancing for joy. Growing up in New York City, I used to love to read Mike Lupica. He was smart, could write well and had a good sense of humor. But somewhere along the way, he actually started to actually think that his opinion was so important it couldn't—and shouldn't—be confined to sports. So it is that every week—and I mean every week—in the middle of reading about Mike Phelps, or Joe Girardi, or Brett Farve, we get a crack about John Edwards, or George Bush, or Lupica's personal obsession, Rudy Giuliani. Every week!!! Yesterday, right after a comment on Joe Torre and the Dodger's chances in the NL West, he writes this. "You better read The Atlantic story on Hillary Clinton's campaign and then ask yourself a question, for the last time: If she was the most qualified manager, if she was ready to lead on "day one," how come she couldn't even manage her own campaign?" A little while later, he writes about Roger Federer and just before a few comments on Mo Rivera and Michael Phelps, he drops this in out of the blue. "I like when our President talks real tough about Russia and then heads off to the ranch for vacation." Lupe...I don't care what you think about John Edwards, Hillary Clinton or George Bush. Neither does anyone else. No one picks up your column to read your witticisms on our President or the Mid-East peace process. We read your column to get your take on Damien Woody, or Carmelo Anthony, or Aaron Rodgers. You're not a political analyst. You're a sportswriter. Write about sports. Anyway, now that's off my chest, I'll go and pat myself on my own back. I told you back in June, you should watch the Olympics for nothing else than Bela's bizarre commentating. http://andaplayertobenamedlater.blogspot.com/2008/06/transactions_30.html Was I wrong. His over emphatic Borat-isms make the studio segments worth while. The Sporting News had an interesting point in discussing the Cardinals' post-season chances. They wrote this: "...the [Cardinals] bullpen has already blown a major-league high 25 saves this season. Mariano Rivera has blown 25 saves too—in the past seven years. I really hope Mike Mussina makes it to 20 wins. if for no other reason that to keep quiet the bean-counters who say he isn't a good pitcher because he's never won 20. As if a lifetime .638 winning percentage, a career WHIP of 1.19 and a SO to Walk ratio of 3.57 (13th all-time, mind you) wouldn't qualify him as a damn good pitcher. Expect 9 men in the box against the Raiders offense this year. Word is out of Raider camp is the passing game actually regressed during training camp—with bad passes being mixed in liberally with drops. Pray that Michael Bush, Justin Fargas and uber-rook Darren McFadden can find a whole in the huge fronts defense will be giving them. On the other hand, the Colts are loving what they've gotten in this year's draft. Mike Pollack has gotten a ton of reps in camp and is the front-runner to replace Jake Scott as the everyday RG and Jacob Tamme, has been called "a Dallas Clark Clone" which is the highest form of praise you could get from Indianapolis coaches. 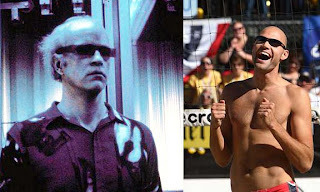 And finally, while we don't mean any disrespect, but doesn't American volleyball player, 6'9" Phil Dalhausser remind anyone else of Manhunter's psycho killer Francis Dolarhyde? No. Just me? I second your Mussina comments. I never really thought of Mike Mussina as a potential hall of famer until this year. The way he has adjusted his style makes me think that he can get close to 300 wins. If his fastball is 87 now, how much worse can it get over the next 3 years? As long as he can mix it up with his breaking pitches, he should be able to hang around as a 4th or 5th starter somewhere. Agreed. It's not a blazing fastball that gets hitters out. So he can reamsin cxrafty for the next few years and get closer to 300. Agreed about Lupica, and the direction of sports writers in general. It isn't enough to break down the sport; now they have to drop in pop culture references as well, or give their opinion on the housing market or whatever. I am interested in sports to get away from that stuff.